We’d love your help. 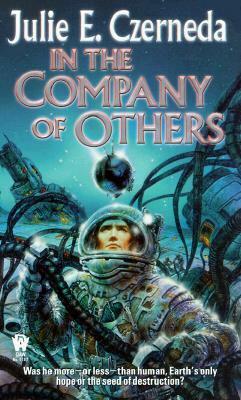 Let us know what’s wrong with this preview of In the Company of Others by Julie E. Czerneda. To ask other readers questions about In the Company of Others, please sign up. When humans reach space and start terraforming new worlds, they first encounter an extra-terrestrial organism they called the Quill. The terraformers thought them a barely sentient oddity, and kept them as a sort of pet. But when the first wave of colonists try to land on the new worlds, the Quill turn mysteriously lethal, killing any who land on the new planets. As panicked colonists turn back to the space stations who don't have room for them, and an overcrowed Earth fires on returning colonis When humans reach space and start terraforming new worlds, they first encounter an extra-terrestrial organism they called the Quill. The terraformers thought them a barely sentient oddity, and kept them as a sort of pet. But when the first wave of colonists try to land on the new worlds, the Quill turn mysteriously lethal, killing any who land on the new planets. As panicked colonists turn back to the space stations who don't have room for them, and an overcrowed Earth fires on returning colonists out of fear of Quill contamination, the terraformer who introduced the Quill is demonized by popular opinion, and commits suicide out of guilt and despair. Fast forward several generations later; Earth's scientific wunderkind, Dr. Gail Smith, is the foremost expert on the Quill. But that's not saying much, since no-one has ever managed to get a sample of the Quill to study; machines can't find them, and most humans die on contact. Gail thinks she might have located a man who lived through contact, though, a descendant of that original terraformer. But if Aaron Pardell even exists, he lives on Thromberg Station, where an overcrowded, highly unstable, stratified mob mentality has emerged over the past years of isolation from Earth. Can she even find him, and if so, will studying him provide the key to conquering the Quill? For me, a book is worthwhile if it stimulates me emotionally (through the characters) or intellectually (through the ideas). I love the characters in the Liaden series series to death, but I can't say that the ideas appeal to me in any particular way. Karl Schroeder, on the other hand, writes some of the most dazzlingly imaginative (and accessible!) far-future SF I have ever encountered, but I don't care at all about the characters. Lois McMaster Bujold generally excels at both and that is why I love her to death. In the Company of Others did neither of those things. The pacing and plot were a mess. The whole beginning part where they were trying to get Pardell off of the station needed a good edit; much of the action was irrelevant to the main plot, and the information could easily have been incorporated elsewhere. The two romantic leads did not meet until about halfway through the book, and by that time I was half convinced that Gail was destined to give in to Malley's bipolar advances. Characterization was erratic. The romance (when it did make an appearance) was composed almost entirely of bizarrely strong physical attraction. And the Quill! Make! No! Sense! Too often I felt like they worked that way because the author wanted them to work that way but didn't want to bother actually thinking up a coherent justification. This book looks at the prospect of living off-planet in a closed society. It looks at what it means to be different--so different that you are alone. How do people act when they are in fear of you? What will you do about it. And all from an well-written science fiction base. It was OK. I was just expecting a bit more, that's all. It wasn't bad though. Still a good time if you have nothing else to do. Why wasn't it excellent? Well, probably because I was too pissed off at the main female character for most of the book, after a while I just felt disappointed with Gail. In the book it's stated that she is such a genius and oh so smart but I never saw evidence of it. Supposedly she had handled conspiracies and intrigue to get the academic career that she had, why then is It was OK. I was just expecting a bit more, that's all. In the book it's stated that she is such a genius and oh so smart but I never saw evidence of it. Supposedly she had handled conspiracies and intrigue to get the academic career that she had, why then is she so blatantly naive and stupid when she comes to the station? I was also annoyed at how they so quickly came to the right conclusions about the Quill... Not believable. A decent science fiction novel from Canadian Czerneda, this puts humanity in far-reaching space stations, when their attempts at terraforming went terribly wrong. Biological disaster left Earth with no choice but to quarantine all those settlers - trapping them in the midst of nowhere on the stations, and unable to land on the planets that were contaminated. One man holds the key to potentially reversing the disaster, and giving those space-born individuals a second chance at feeling fresh air. Saw this book on a list of sci-fi books you "have" to read and decided to give it a whirl. After all, I haven't read much sci-fi lately and the premise, coupled with a female author, seemed to promise something new. So I gave it a shot. Turned out to be a decent book, but it was far below my expectations. The premise is pretty much as the synopsis tells it. But from there everything felt two-dimensional. So much so that at one point about halfway through I put this away. After 200 pages I just di Saw this book on a list of sci-fi books you "have" to read and decided to give it a whirl. After all, I haven't read much sci-fi lately and the premise, coupled with a female author, seemed to promise something new. So I gave it a shot. Turned out to be a decent book, but it was far below my expectations. The premise is pretty much as the synopsis tells it. But from there everything felt two-dimensional. So much so that at one point about halfway through I put this away. After 200 pages I just didn't care what happened to anyone. But about a week later I picked it back up to finish. In the end, I still didn't care. Nobody was likable, and the only emotional attachment I had was to the actual "bad guy" Quill, who in the end become harmless and victims of humanity. It's been many years since I first read this, and upon re-reading I wondered a little why it had stuck in my mind as particularly good. My reading tastes must have developed a lot more than I realized. Not that it's bad, mind. But it's not that impressive, and parts are outright... embarrassing. I'm guessing it was because it had interesting aliens, for which I am a total sucker, and believable characters, which often is a crapshoot in SF-- when you get big ideas, characters can get short shrift It's been many years since I first read this, and upon re-reading I wondered a little why it had stuck in my mind as particularly good. My reading tastes must have developed a lot more than I realized. Not that it's bad, mind. But it's not that impressive, and parts are outright... embarrassing. I'm guessing it was because it had interesting aliens, for which I am a total sucker, and believable characters, which often is a crapshoot in SF-- when you get big ideas, characters can get short shrift. But Czerneda always delivers both. I probably have near-zero patience these days for the sort of romance that takes place here -- the kind of romance where people fall in love head over heels based solely on physical attraction. I know that happens in real life (and it rarely ends well), but I hate this in fiction because fiction has only words to convey what attracts people to each other, it has nothing beyond that, no "chemistry", no non-verbal connections, and so the words need to carry a whole lot more information. Alas most bad romance writers don't realize that (or maybe they expect the reader to fill in the blanks based on other equally bad romances), and so we get this fait accompli which tends to feel empty to me instead of being filled with the kind of wonder the real thing elicits. Ms Czerneda's romance never makes my heart go pitter-patter; instead I generally wish it weren't part of the books -- my favourite is the Web Shifter series where the most important relationships are friendships (though come to think of it, the primary one one also has this distressing instant simpatico thing going which at first clued me falsely into it becoming a romance as well, but at least there's development). In this case the romance actually has an important point to make, which has already been made in other ways in the first part of the book, but those attempts don't really carry the message well enough -- how horrifically lonely it must be for a human being to experience the touch of other humans as painful. So I am okay with it being in the book on principle, but I wish there had been more substance to the development. Especially since those two people must be what, at least 20 years apart in age? There is a tremendous imbalance in experience here, two people from dramatically different worlds coming together, and it doesn't feel amazing to me, instead it feels weird, like Gail is robbing the cradle, and with somebody over whom she has power as a scientist versus test subject to boot -- Malley is right to distrust her. I'd have been happier if the romance had been between Malley and Aaron (no, not because then it would be gay, though that would be cool as well, but simply because they had a lifetime to grow close, and they do clearly love each other deeply -- I find that relationship much more emotionally fulfilling to read about). In general the characters are well-developed, and the interactions between the scientists shows that Czerneda has some practical life experience in navigating that type of environment; this is similarly satisfying as that aspect of Species Imperative, and Gail has a similar competence to Mac. Anyway, onto the sfnal part, which is more satisfying. I liked those aspects, especially the life on a crowded space station, though it would have been a good idea to foreshadow the later actions of the 'siders; that came out of the blue, and it would have been really nifty if one could have suspected it -- as an inveterate mystery reader I am always looking out for clues and derive a lot of pleasure from piecing things together as a book progresses. The dealings with the alien Quill are IMO not developed enough, or at least the pacing seems off; everything happens very quickly at the very end. The central warning sort of goes under -- a warning humans will likely not heed, because it's not like they ever have before; the warning about environmental contamination and its unforeseen and sometimes deadly consequences. Maybe this book tries to do too many things -- I could easily see this being at least a duology. Have read other science fiction novels by Julie Czerneda and loved them (in particular, her Species Imperative series). Therefore, I began reading this book with hopeful anticipation. The story is very good and the big ideas intriguing. However, they too often get lost. This novel would have benefited from an editor requesting that it be cut by at least one-third. (Editors sometimes ask authors to lengthen their novels, which might have happened here.) Too much of the book includes unnecessary d Have read other science fiction novels by Julie Czerneda and loved them (in particular, her Species Imperative series). Therefore, I began reading this book with hopeful anticipation. The story is very good and the big ideas intriguing. However, they too often get lost. This novel would have benefited from an editor requesting that it be cut by at least one-third. (Editors sometimes ask authors to lengthen their novels, which might have happened here.) Too much of the book includes unnecessary description, comment, even whole sections. I found myself skipping a lot, trying to pick up the lost (or buried) thread of the story. I really enjoy Julie Czerneda's books. This book does read differently than her other books. There were parts of the story that were hard to understand on what she was trying to get across. Overall, I couldn't put the book down and was in deep with the story. It is a large book and well worth the read. I love the characters and thought they were unique and loved how she portrayed how the human race reacts to alien life, what it means to be alone (& not) and humanity's need to colonize. I loved this book. I hated this book. There were great moments and incredibly vivid characters but it also seemed really drawn out. I am glad I read it but at the same time when I was finally done I wanted to donate it to my brother's pet rabbit. I kept it in the end. Julie the biologist shines in this book. I love how you can't just guess the ending, but when it happens it totally makes sense. And I loved the biology/alien life questions she raises. The aliens aren't sentient, but they make a huge impact on extra earth life. More aggressive than Czerneda's other books that I've read in terms of sci-fi ideas, this is also slightly more flawed with a handful of jarring mistakes. As always, the emotional situations and impossible romance are gripping and tender. Incredible book. It took a few chapters to warm up to the story, however the characters were instantly engaging. Like another reviewer mentioned, the ending was surprising but in retrospect made complete sense. I enjoy how the titles always become pivotal moments in her books. Great world building in this novel of terraforming meets accidental introduction of a seemingly harmless alien life form,the Quill.Realistic and intelligently written characters in this stand-alone book.Highly recommended. slow start but real nice-lots of twists turn character development etc. I really enjoyed this novel. It was fun and engaging. I adored this book when I read it many years ago, and I fianlly came across it again recently and found even the grown up me still adores it. It's obvious from my ratings that I enjoy of all Julie Czerneda's books, but this--and her first--are my very favorites. A complex build-up concluded with a magic resolution. I enjoyed reading it but felt let down by the ending. I love the way Julie Czerneda writes. This is a great book that has a feel-good ending. Great concepts about aliens and how things have unintended consequences. The romantic relationship wasn't as well-drawn as expected, so if you're reading it for that aspect you may be disappointed. It was fine otherwise! I enjoyed it. An interesting concept, but a mediocre climax.